Ralco RZ pulleys are designed with a unique blend of performance and reliability. They are made from the highest quality 6061 aluminium billet. Ralco RZ pulley conversions are proven to produce maximum power gains with the performance benefits of weight reduction, which you wouldnt receive from factory parts. Throttle response, horsepower and torque are all increased with this great product. Pulley set Includes crank, alt. 96-97 Mitsubishi Lancer Evo IV 2.0L DOHC 16V Turbo AWD Auto, Manual CN9A 4G63T. 98-99 Mitsubishi Lancer Evo V 2.0L DOHC 16V Turbo AWD Auto, Manual CP9A 4G63T. 99-00 Mitsubishi Lancer Evo VI 2.0L DOHC 16V Turbo AWD Auto, Manual CP9A 4G63T. 01-02 Mitsubishi Lancer Evo VII 2.0L DOHC 16V Turbo AWD Auto, Manual CT9A 4G63T. 03-05 Mitsubishi Lancer Evo VIII, Evo VIII MR 2.0L DOHC 16V Turbo AWD Auto, Manual CT9A 4G63T. 06-07 Mitsubishi Lancer Evo IX, MR 2.0L DOHC 16V Turbo AWD Auto, Manual CT9A. 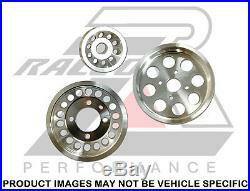 The item "Ralco RZ Performance Underdrive Pulley Kit Mitsubishi Lancer EVO 7 8 9 (4G63)" is in sale since Tuesday, January 08, 2013. This item is in the category "eBay Motors\Parts & Accessories\Car & Truck Parts\Suspension & Steering\Other".